1. Grease and line bottom of a round spring form cake pan with a circle of parchment paper. Preheat oven to 340 F.
2. Separate egg yolks from egg whites. Beat egg whites for two minutes and slowly add in sugar, whisking until stiff peaks form. Slowly beat in one egg yolk. 3. In a mixing bowl, sift flour and cornflour. Slowly mix in sifted flour into egg white combination, gently stirring after each addition. 4. Pour cake batter into pan and bake for 35 minutes. Remove from oven and allow to cool in pan. 1. In a small bowl, mix gelatin and 2 tbsp water. Let it soak for 15 minutes. 2. Break chocolate into chunks and melt in a microwave, being careful not to burn the chocolate. 3. In a saucepan, bring 400 ml of the whipping cream to a boil, remove from heat. Place the rest of the cream into a bowl and in the freezer to cool. 4. In a saucepan on low heat, warm soaked gelatin until dissolved, do not boil. Mix in boiled whipping cream into gelatin and then add melted chocolate, stirring until smooth. Place in fridge to cool. 5. Remove the separated cream from the freezer and beat until stiff. Add it to the cooled chocolate, whipping cream, and gelatin mixture. 1. 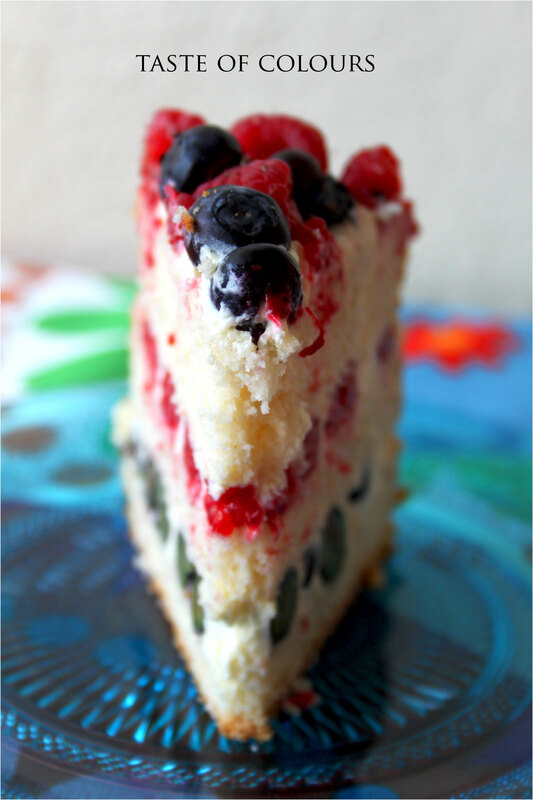 Using a large, sharp knife, slice sponge cake into three layers. Place one layer on a serving plate and sprinkle with blueberries. Cover with a layer of chocolate mousse. 2. 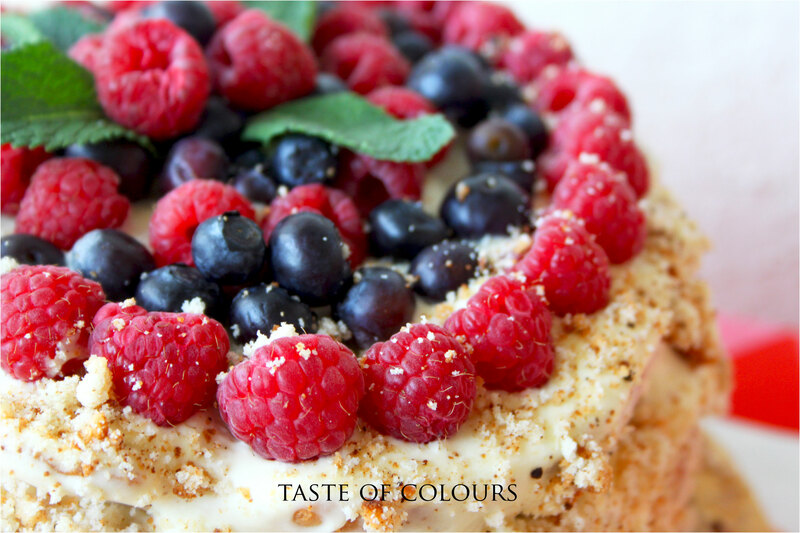 Place second sponge cake layer on top, sprinkle with raspberries, and cover with a layer of chocolate mousse. 3. 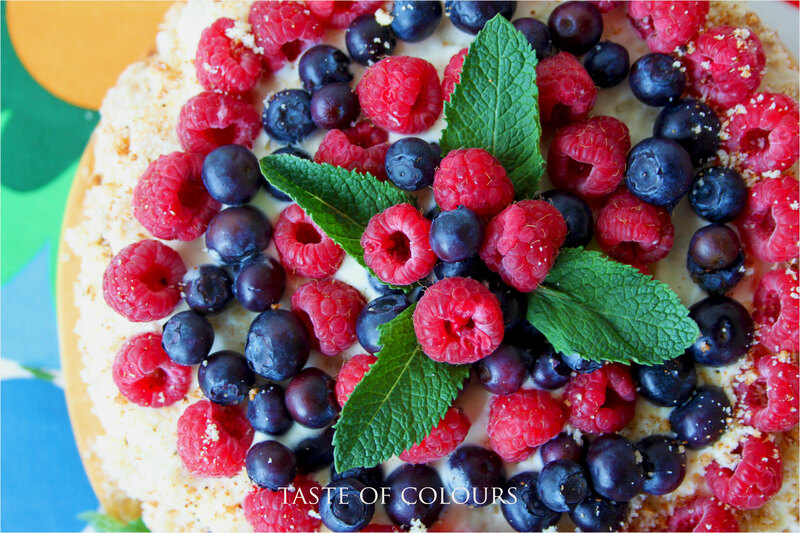 Spread the rest of the chocolate mousse around the sides of the cake and sprinkle top with powdered sugar, cinnamon, blueberries and raspberries. 4. 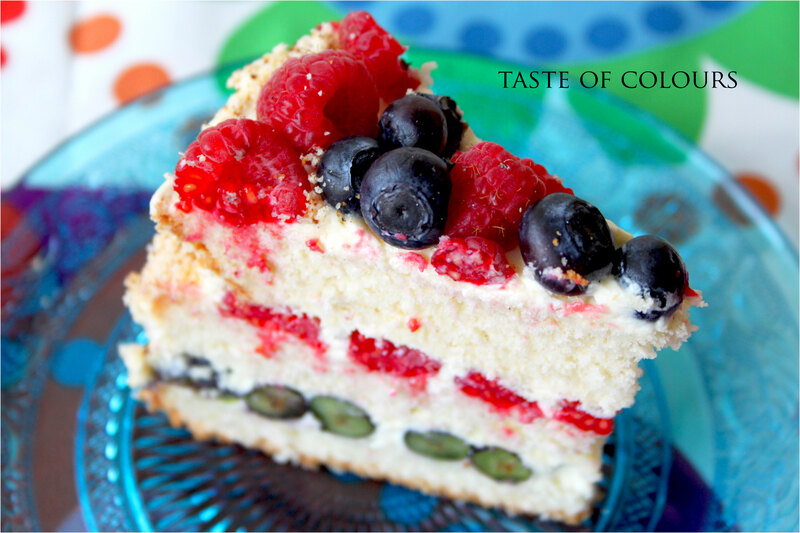 Cover the sides of the cake with a mixture of coconut flakes and biscuit crumbs. MMmmm, this cake looks fabulously tasty and I wish I could just reach into the screen to take a piece! And it doesn’t look too difficult to make either – I’ll have to add it to my recipe book! Great post, thanks! 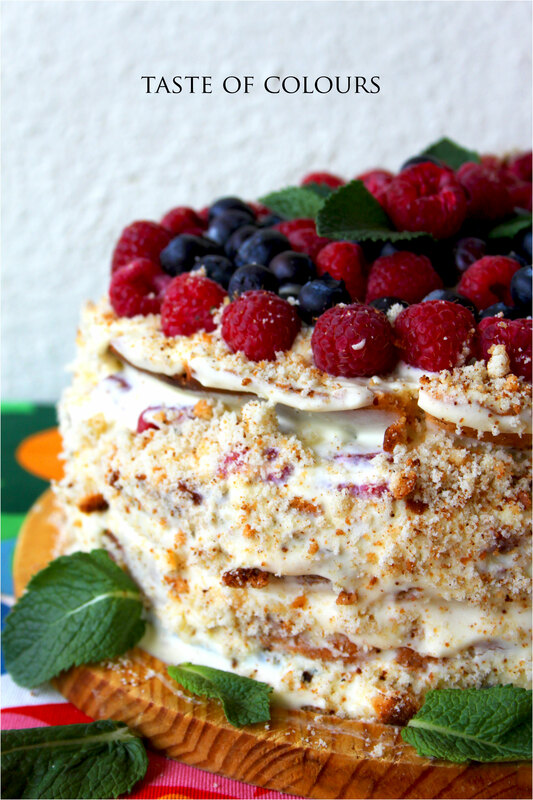 Beautiful torte! That fruit makes me long for summer.